On Saturday August 6th, 2016 Venice residents of all cultural and economic backgrounds protested the most recent case of unscrupulous development in their neighborhood— 742, 744, 748, and 748 Brooks Ave headed by Lighthouse Investments/ Lighthouse Brooks LLC (a large donor to Mike Bonin’s 2017 reelection campaign). The general background is that a 5 unit apartment building (2 affordable units) was demolished to install prefabricated condos. While the shenanigans to get this development project cleared is sadly nothing new it has been exuding more negativity than the average gentrification project of recent. Not only did residents have their street closed for four days, have their street’s infrastructure damaged, water use cut off, it also led to the tragic murder of a Lighthouse Development contracted employee. The 20+ resident protest was an effective demonstration garnering attention and literature exchange from passersby on Brooks Ave. as well as Lincoln Blvd. The only instances of negativity was when a silver sedan of young white men yelled “Build the wall” to an African American and Chicano man who were a part of the demonstration, and the other instance was when the security guard watching the property called police blatantly lying about our protest activity. Aside from the brief negativity it was a great display of neighborhood unity for a common just cause. Aug 2nd, 2016— While bringing in the pre-fab houses, one of the trucks cracked the street and broke a sewage pipe. This led to residents’ water being out for the whole day if not longer. This unfortunately is yet another example of Venice’s failing infrastructure due to overdevelopment. This Brooks Ave situation being the 4th water main infrastructure failure in the past few weeks within the same area. A resident spoke to the crane representatives and determined that crane was at 150 feet but had the ability to extend to 400 ft. and weighed about 350,000 pounds. The crane representative said DWP was absorbing all the costs of the repair because the project had pre-approval from the city for the crane to be there. So it seems the urgency for DWP to make the street ready after the the infrastructure fiasco was for the crane the following day, not for the neighborhood residents to have access to their homes again. Contracted Employee Marvin Ponce Killed at Corner of 7th/Brooks Ave. This project violates the Venice Coastal Zone Specific Plan in many ways, as indicated in the notes on the attached 4 VSO’s. Also, this project is required to be processed using the Specific Plan Project Permit Compliance Review (SPP) and not the VSO exemption processing procedure. This should have been done at the same time as the CDP was done. They waited until AFTER the CDP was issued and just before the building permit was issued because they processed one VSO for each of the four single-family dwellings; whereas they should have processed the “demo and 4-lot small-lot subdivision” construction project using a SPP, along with the CDP. See also Steve Nazemi for next item. It should NOT be complicated and would not be complicated if the proper process and approval controls were in place, but there are essentially no controls for the land use/development process and the process is spread out among many people, this is done on purpose! Please understand that Venice is being given away as you read these lines. We need to stop Mayor Garcetti , CD11 Mike Bonin, LADBS, and LA City Planning now! Attorney General Mike Feuer office is also in the thick of it all, from not pursuing Criminal Forgeries, to delaying the appeals process, the City’s Strategy is to be as convoluted as possible to try and keep us from connecting the dots. Please join us in raising funds to support our lawsuit and Save Venice from those who seek to exploit her. Thank You! PLEASE DONATE TO THE SAVE VENICE LEGAL DEFENSE FUND – THANK YOU! SEE YOU IN COURT – Venice Coalition to Preserve Unique Character (VC-PUCC) filed a lawsuit last week against the City of Los Angeles, which the coalition website charges is complicit in development that is “destroying Venice’s quaint, historic neighborhoods and affordable housing at an alarming rate.” The coalition charges that the city’s actions violate the California Constitution, Coastal Act, as well as local land use protections. Residents and activists have mobilized to fight for neighborhood preservation in the coastal community, citing that over the past two years, the Los Angeles City Planning Commission has approved hundreds of mega-developments in the Venice Coastal Zone, ignoring planning and zoning laws.According to the suit, the City has been greenlighting massive projects through the “Venice Sign Off” (VSO) procedure, which allows developers to fast track construction without neighborhood notification or public hearings about potential projects. Sues L.A. City Planning for violating the California Constitution, the California Coastal Act and local Land Use protections. Venice, CA March 2, 2016 – Developers are destroying Venice’s quaint, historic neighborhoods and affordable housing at an alarming rate, and the City of Los Angeles is complicit. Aided by the City Planning Department, developers are pushing low and middle-income residents and communities of color out of Venice. Local residents have joined together to fight back against the destruction of their homes and communities. The City of Los Angeles Planning Department, real estate speculators, and developers are irreparably altering the neighborhoods and communities that make Venice unique. Now, the Venice Coalition to Preserve Unique Community Character (VC-PUCC) has filed a lawsuit* against the City of Los Angeles to stop this egregious and unlawful pattern and practice. In the last two years, the Los Angeles City Planning Department approved hundreds of colossal developments in the Venice Coastal Zone in violation of laws that protect residents’ constitutional rights and Venice’s special community character. The City of Los Angeles Planning Department’s VSO procedure fails to ensure that developments comply with the Venice Land Use Plan requirements that all development respect the mass, scale, character and landscaping of existing neighborhoods. Additionally, the City of Los Angeles Planning Department has illegally issued hundreds of Coastal Exemptions, which has enabled developers to by-pass important protections imposed by the California Coastal Act. These projects have completely blindsided residents, who often do not realize that construction has been approved on their streets until bulldozers arrive at 7 a.m. and it’s too late to raise their voices. Today, the Venice Coalition to Preserve our Unique Community Character says enough is enough. It’s time for the City to honor Venice residents’ Constitutional rights, comply with the law, and respect the neighborhoods and communities that make Venice unique. – FULL public notification and participation, as set forth by Federal, State, and Local Law, in any and all proposed developments in VENICE, CA. Additionally, we the undersigned call for full enforcement of the California Coastal Act, the Mello Act, and the Venice Specific Plan, because the cumulative effect of recent development in VENICE, CA is diminishing the quality of life for it’s residents, and negating the purpose of said protections put in place to preserve the Coastal Zone. 1) Proposed 3-lot Small Lot Subdivision in violation of Venice Specific Plan. 2) Proposed 3-lot Small Lot Subdivision in violation of Venice Specific Plan. Community members are alarmed their phone calls and emails expressing concern and asking questions to City Planning are not being returned. 1. City Planning is interpreting the Small Lot Subdivision Ordinance (SLSO) to trump the Specific Plan, although the law says that specific plans always trump ordinances. The City is interpreting the Small Lot Subdivision Ordinance to allow more units on lots than the Specific Plan allows, and is not requiring any guest parking at all, and is allowing tandem parking that people often don’t use, rather than side-by-side parking. 2. Allowing buildings to be constructed to the maximum possible size even when the proposed building is totally out of scale with the neighborhood i.e. three story buildings that block all of the neighbors’ sunlight in a one-story or two-story neighborhood. The Specific Plan requires an evaluation of the compatibility of the mass and scale of the proposed building with the other buildings in the neighborhood. The Planning Department does not do this, and they have set up a process where there is no appeal. If the Planning Department continues to get away with this, soon Venice will be all 3-story compounds with very little sun or air between the buildings. 3. The Planning Department is issuing illegal DIRs that blatantly violate the Specific Plan. Then the City says that there’s no appeal because the 14-day deadline has passed. The community has no real notice and no opportunity to respond. The City refuses to send us a .pdf of the DIRs as they are issued, only a mailed copy. Whereas per The CA Coastal Act. b. areas possessing significant recreational value. c. Special communities or neighborhoods which are significant visitor designation areas. Areas that provide existing coastal housing or recreational opportunities for low- and moderate income-persons. The public has a right to fully participate in decisions affecting coastal planning, conservation and development. “Permitted development shall be sited and designed to protect views to and along the ocean and scenic coastal areas. Venice is being over-developed at an alarming rate, changing the unique character and culture of this historic city. The Venice CPUCC group is dedicated to protecting and conserving our Venice Beach community from over-development and the onslaught of gentrification, by sharing and caring about our community, with a focus on planning and development according to the Venice Specific Plan, the Coastal Act (1976) and the Mello Act. Long Beach CA, March 12, 2014 — The Venice Coalition to Preserve the Unique Community Character (VCPUCC) rallied the Venice community to the Coastal Commission meeting in Long Beach, for testimony and complaints regarding the practice of allowing demolitions based on waivers. 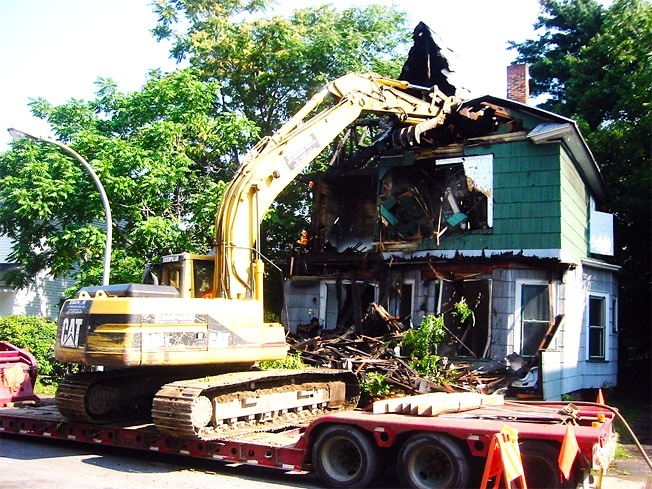 Small bungalow homes are fast being demolished and McMansions for the wealthy built with no community input, not to mention notice to the people who live next door. These “de minimis” waivers are for development projects the City of Los Angeles has never held a public hearing. The City Planning Department interprets the Venice Specific Plan and does a VSO (Venice Sign Off), which is a developer’s dream fast track straight to the Coastal Commission for a “de minimis” waiver approval. No neighbors notified. No community input. The developer or owner is trusted to post a letter size paper notice somewhere on the property ten days prior to the monthly meeting of the California Coastal Commission, which meets at a different place in the state each month. The posting of these notices have been spotty to be polite, but this time one of the waivers became an enforcement issue for the Coastal Commission. A waiver asking the Coastal Commission for a demolition, which had already been demolished in January. And the City approved it. That one even skipped the Coastal Commission’s authority. Oops. The Commissioners and Staff discussed the options and denied the Venice waivers in front of them for March. Those projects now have to go through the process required for developments in the Venice Coastal Zone, including hearings. No Venice demolitions were approved this round. That one decision by the Coastal Commission gave the community more of a fighting chance to stop the demolition of Venice. Coastal Commission Staff, at the request of Commissioners, will be notifying the City of Los Angeles regarding the future of, or the lack there of, any more demolition waivers in Venice.